I finally participated in a sketch challenge, only to realize that I totally missed the deadline. :) Oh, well. I still LOVE my card I made. I was so excited to be able to come up with a fun Easter card even though I had pretty much no Easter stamp sets. What do you think? Isn’t this bunny adorable?! I made this card with my son in mind and had fun pulling papers, stamps, and punches to create an easy yet super fun Easter bunny card. I had seen different cards out there using the Nursery Suite specialty designer paper for Easter because it has a couple patterns with bunnies on them. Let me tell you, that was one of those smacks to the forehead kind of moments! I was so fixated on this paper being “baby” paper that I didn’t even think about how it is so fabulous for so many other projects. Just you watch, I’ll be pulling it out a lot more in the future. Then I saw this punch art bunny on Jan Tink’s blog and knew I just HAD to make one myself! 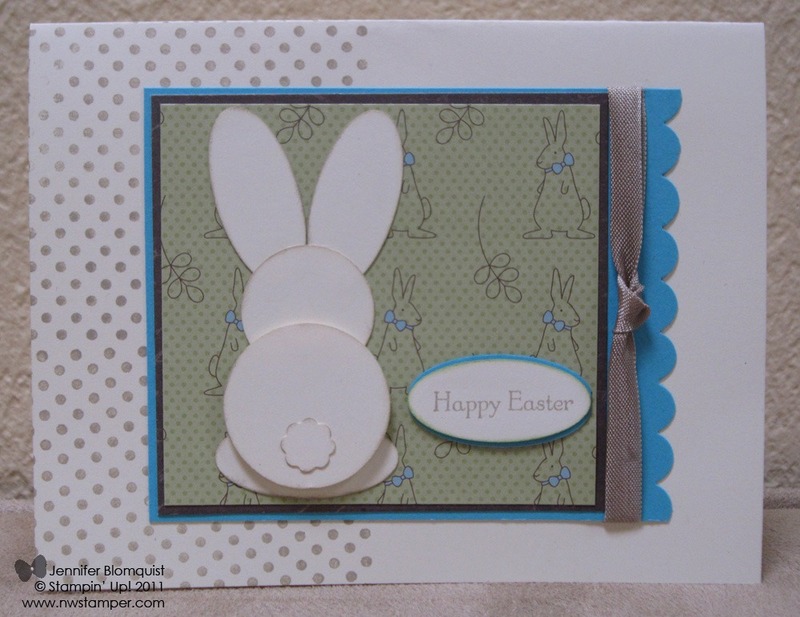 So, I combined the paper, this bunny, and the Stamping 411 sketch from last week to make it. So fun! The bunny is made by punching 3 small ovals (one for the feet and two for the ears), one 1-1/4” circle for the body, one 1” circle for the head, and one small flower punch from the Punch Pack for the tail. The ribbon is just a piece of Crumb Cake seam binding ribbon (have I told you how much the seam binding ribbon rocks?) that I folded in half and then knotted. Make your own Easter bunny! Get the supplies you need from the online store here, or grab the paper and punches you have and play around! Have fun! Don’t forget! TODAY is the last day of my Tax-Free weekend! « It’s a Tax-Free Weekend & Announcing Customer Rewards! I really like the subtle changes you made from the blog sample you listed above. The larger head is so cute. I also like how the blue card stock pulls out the blue in the designer paper. Well done, Jennifer! Love your punch bunny…it looks soooooocute on the card!! !